What are Business Negotiation skills? A negotiation is known to be result-oriented conversation for reaching at a mutually-benefiting conclusion between two or more individuals. The point might benefit all the participants, or some of them, or just a single individual. Negotiation skills are targeted to benefiting individual or a group by resolving the differences, or to satisfy several interests. We are going to discuss the skills needed to be pull through successful business deals. Individuals working in a team with the sales and marketing portfolio are the one’s this tutorial is targeted to. 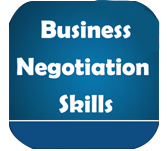 Having adequate negotiation skills will help in cracking a deal that is mutually advantageous. One should be aware of corporate hierarchy, running of operations within an organization and the “Rewards & Incentives” structures of companies.